The 3D apps are an important part of the Optimus 3D Max software - so much so, in fact, that they have their own category in the menu - 3D Games & Apps. The Optimus 3D Max has the same set of four 3D-enabled games as the Optimus 3D - Lets Golf 2, Nova, Asphalt 6 and Guiliver's Travels. That's not a lot of content, but it's more than what most Android handsets offer - and these four are all rewritten to make use of the 3D screen. Much like the gallery, each of the games has a toggle to set the depth of the 3D effect and you can even turn it off if you want. The 2D-to-3D app convertor comes pre-installed on the Optimus 3D Max. You can convert some (compatible) apps to 3D, but don't get your hopes too high - the end result isn't always good and the frame rate will drop significantly (for example after conversion, the NenaMark 2 benchmark from 25.6 fps dropped to 13.4 fps). The LG Optimus 3D Max is running Android 2.3 Gingerbread and has a WVGA screen, which should give it access to the majority of apps in the store. However, there's a notable shortage of 3D-compatible apps. You need to go to LG World for that. There you can find native or convertible 3D games. Unfortunately, despite the variety of apps available, most of them are of questionable quality and graphics and the worthy ones are extremely rare. The tab layout of the regular Play Store should be quite familiar. You can browse the store's contents by category, featured, top paid, top free, top grossing, top new paid, top new free and trending. Apps usually have several screenshots (some even offer a demo video) so you can get an idea of what the app looks like before installing it. You can also check out comments and ratings, as well as the number of downloads and so on, to help you decide if the app is worth it. 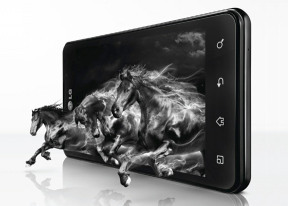 The LG Optimus 3D Max has a built-in GPS receiver, which managed to get a lock in under two minutes (with A-GPS switched off). If all you need is a rough idea of your whereabouts (within 150 meters or so) the Cell-ID and Wi-Fi network lock are almost instant..